Whether it’s rosé (France), rosato (Italy), rosado (Spain), Tavel (Rhone Valley) or simply “blush wine” – these region-specific wine terms point unashamedly to pink wine. Rosé wines are the rising stars and delightful chameleons of the wine industry. Ranging in color from hot pink to salmon and copper to pale blush, there are countless shades running from soft and subtle to loud and proud depending on which grapes were utilized and how long the grape skins were in contact with the juice. Happily, the versatile nature of rosé wines doesn’t stop there! Rosés also come in a wide range of styles: sweet, off-dry or bone dry with most Mediterranean sources of distinct rosés being decidedly dry. Rosé wines are essentially red wine grapes in summer suits. Most rosés are derived solely from red grape varieties (though some producers blend red and white wine together to find their perfect pink). During a brief encounter with grape skins, the must (juice) takes on more subtle color variations; however, the longer the contact time the more vibrant the pink hues tend to become. Shades of pink are also significantly influenced by the type of grapes used for the specific rosé wine. Typically, the thicker the grapes’ skins, the more vibrant color pigments they can offer a vat of must. 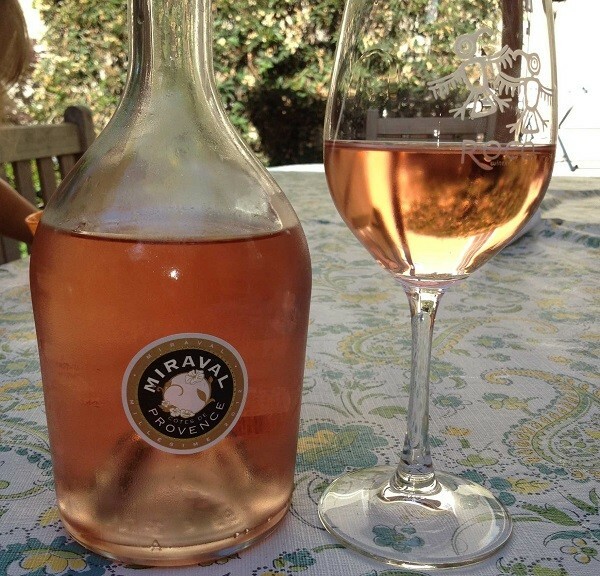 The most popular grapes for initiating a bottle of rosé are Syrah, Grenache, Cinsault, Mouvedre, Merlot, Malbec, Zinfandel, Cabernet Sauvignon, Pinot Noir, Tempranillo, and Sangiovese. These grape varieties may either be used solo or in a synergistic blend, with many regional rosé offerings basing their grape picks on the more prolific red wine varieties found in each growing zone. For example, many of Italy’s rosatos are founded on the popular Tuscan grape, Sangiovese. Likewise, Spain’s rosados find firm footing with the high-profile Tempranillo or Garnacha grapes coming out of the Rioja region. Typically delivering more body than a white wine, but lacking the tannic grip of a dry red, rosé wines tend to be more subtle versions of their red wine counterparts. The fruit character steers toward red berry profiles with strawberry, cherry, and raspberry along with significant citrus and watermelon debuting on a regular basis. Rosés enjoy a happy range of palate profiles, running from completely dry to fairly fruity and sometimes sweet, depending on the region and producer. If you prefer dry and exceptionally food-friendly wine? Then scout for Mediterranean rosés from southern France, Spain or Italy. While often enjoyed as an engaging aperitif, rosés are remarkably adept at pairing with a wide range of regional foodie finds. Generally carrying higher levels of mouth-watering acidity, these pink drinks are easy pairing partners. From the quintessential Mediterranean cuisine of fresh fish and signature tapas to summer salads, shellfish or the smoky fare of South American entrees and carrying on quite well with the burgers, brats and pub grub of many American treats, well-chilled rosés promise to be one of the most adaptable wine pairing picks around.